One day nearly 20 years ago, Stephen Bassett realized UFO abductees needed a lobbyist. He had spent four months working for the Program for Extraordinary Experience Research out of a modest townhouse in Cambridge, Massachusetts, when he had the epiphany: He could continue his research with John Mack, the leading authority on the alien abductions, for the rest of his life - but it would never make a difference. The alien issue was really heating up in 1996, what with the summer blockbuster "Independence Day," and Bassett worried someone else would get the same idea. So he quit his volunteer gig, piled his belongings atop his beat-up Mazda RX-7 and drove off to Washington. "I get down there, and I file" the lobbyist papers, he recalled. "I'm the first one. Nineteen years later, I'm still the only one. I coulda taken my time." Bassett, a balding man with expressive eyes that seem to go from blue to green, has long had one goal: Get the government to admit it has been covering up proof of alien visits. It has been a lonely battle, but he is convinced the stars have finally aligned for his convoluted theory, which involves the Clintons, their longtime adviser John Podesta and a now-deceased billionaire. "I want to see disclosure by the New Hampshire primary," he said brushing crumbs off his black dress shirt and purple tie during lunch at the National Press Club this month. "And I can make the case that it's going to happen." Bassett was born in 1946 to a military family that moved all over the country. He read science fiction, built model planes, enjoyed the cheap bowling and milkshakes on the bases. His father rarely spoke to him and fought constantly with his mother. And Bassett struggled with obsessive-compulsive tendencies. He entered Georgia Tech just as the United States was going to war in Vietnam. While he was able to avoid the draft, the conflict darkened his worldview. There were too many secrets being kept, he felt; his country seemed on a path to disaster. After college, he spent a couple of aimless decades freelancing as a tennis pro and business consultant, subsidized by an inheritance from his father. Then, a book changed his life. 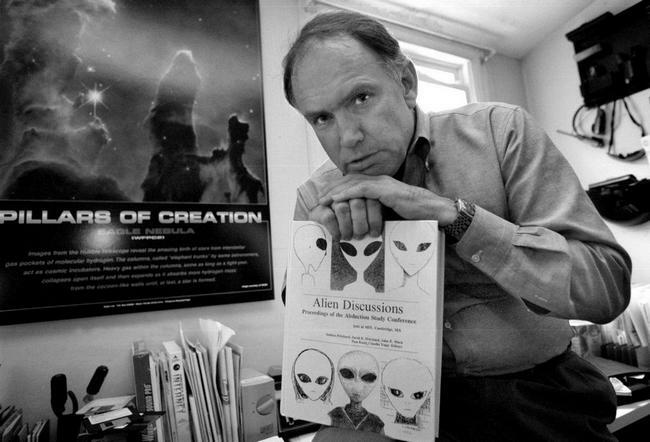 It was called "Abduction: Human Encounters with Aliens," and unlike other literature on the subject, it was written by an acclaimed scholar: Mack, a Harvard psychiatrist with a Pulitzer Prize for Biography under his belt. Mack, who died in 2004, began his research as a skeptic, interviewing dozens of subjects that he at first assumed suffered from mental illness. In the end, he wasn't so sure.